We're excited to offer a non-invasive soft tissue laser for tongue and lip release in infants to promote comfortable and natural breastfeeding! Call us at 978-694-4100 to learn more today! Dr. Marcy is accepting new patients ages 0+ Come visit us today! We offer I.V. sedation for our young patients to help them safely and comfortably obtain dental treatment! All treatment is completed painlessly in one visit! Dr. Marcy offers porcelain crowns to help your child have a healthy and beautiful smile! Our white crowns offer an aesthetic solution that looks natural, and is strong and long lasting! We are conveniently located in the Wilmington Crossing Plaza on Main Street. Dr. Marcy Gabrilowitz is a board certified specialist in pediatric dentistry. We offer dental care for children from infancy through the teenage years. Thanks for taking time out of your day to learn more about Pediatric Dental Care of Wilmington. 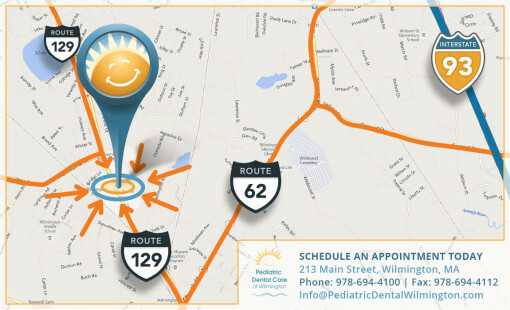 We are a state of the art pediatric dental office conveniently located in Wilmington Crossing Plaza on Main Street. Our goal is to create a fun, positive and educational experience for our patients and their families from the moment they walk through the door. DID YOU KNOW? Dr. Marcy Gabrilowitz is the only pediatric dentist practicing in Wilmington, Massachusetts. Give us a call anytime 978-694-4100 or swing by our newly constructed office. It’s bright, fun and inviting for all ages, not simply the little ones. Our goal is to create a fun, positive and educational experience for our patients and their families from the moment they walk through the door. We realize that going to the dentist can be difficult for children, so our team strives to create a warm, friendly and welcoming atmosphere. We pride ourselves in creating a relaxing environment for your child. Our goal is to develop a trusting relationship with our patients to provide both a pleasant experience and excellent dental care.